OnePlus 5 Limited Edition Soft Gold With 6 GB RAM Announced! 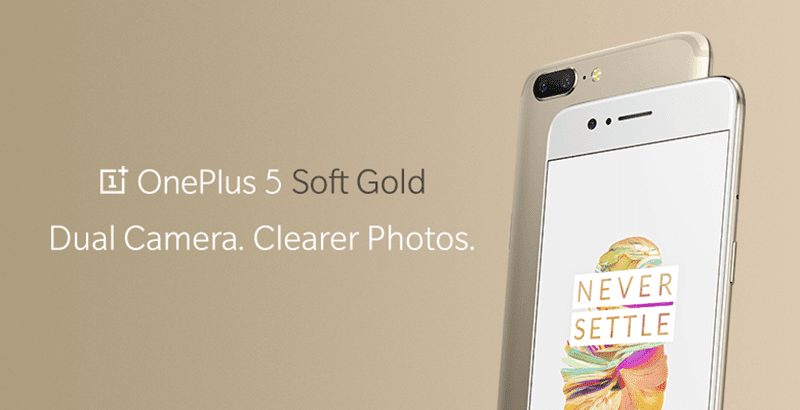 Home / mobile / news / oneplus / OnePlus 5 Limited Edition Soft Gold With 6 GB RAM Announced! OnePlus just announced a new variant of the OnePlus 5, the Limited Edition Soft Gold color option that will be available on the OnePlus 5 in select quantities. OnePlus boasts that it takes an average of 180 days to create and perfect a coating of Soft Gold with sandblasted and well polished finish. Technically, this has the same specs and features of the 6 GB RAM and 64 GB ROM variant of the OnePlus 5. It sports the 5.5 inch Optical AMOLED screen, Snapdragon 835 octa core processor, 3,300 mAh battery with Dash Charge, 16 MP + 20 MP dual rear camera setup, 16 MP selfie cam, LTE connectivity, and Android 7.1 Nougat w/ Oxygen OS. Sales at oneplus.net start on August 7 at noon EDT.